We’d love your help. Let us know what’s wrong with this preview of The 365 Bullet Book by Marcia Mihotich. "Say hello to the bullet system: a revolutionary organization method that will increase both your efficiency and your creativity. At its simplest, the bullet method will provide you with a fool proof to-do list that will ensure you never miss a task or appointment again. Take it just a step further and its principals will let you organize your present, take note of the pas "Say hello to the bullet system: a revolutionary organization method that will increase both your efficiency and your creativity. At its simplest, the bullet method will provide you with a fool proof to-do list that will ensure you never miss a task or appointment again. Take it just a step further and its principals will let you organize your present, take note of the past and plan your future. 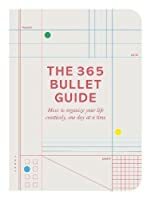 The 365 Bullet Guide is an easy-to-follow book that will teach you the bullet system. There's an exercise for every day of the year and each takes 365 seconds or less to complete. With simple, clear instructions, this book will show you how to incorporate the bullet method into your life as gradually or quickly as you like. The joy of bulleting is that it is both holistic and completely customizable to your own aesthetics and habits, so you can create your own journal from scratch and put into practice as many of the hundreds of ideas and techniques as your like such as habit trackers, sleep logs, handwriting exercises, and much more! 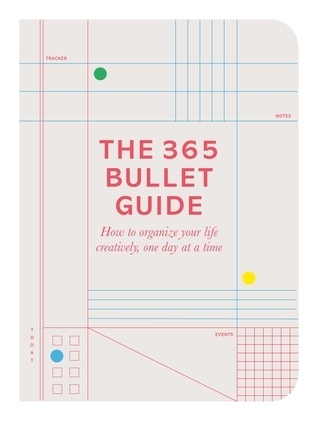 Whether you’re a secret scribbler or a to-the-point minimalist, The 365 Bullet Guide is your indispensable guide to an elegantly organized life. With contemporary illustrations by Marcia Mihotich, this book will help you to build a better life. To ask other readers questions about The 365 Bullet Book, please sign up. I’ve heard, of course, of bullet journals, but I have never actually seen one until I ran across this one I was able to check out of my library. It is excellent, I thought, for someone who is interested in setting up and maintaining a bullet journal for the first time. It gives you specific suggestions for how to organize your journal and how to keep up with it daily, and (I liked this the most) it gives you examples of illustrations you can easily learn to make to put into your journal. Another great Bullet Journal Book. This book includes tons of examples that I want to create in my journal. I can't wait to get started. This book was easy to read page by page or just to flip through. some cute ideas for spreads, but not much I haven't seen already. great for a beginner. Some good “bonus” ideas on using your Bullet Journal in new and creative ways. Good compliment to others out there. Everything in this book can be found for free scrolling through Pinterest or Instagram. Don’t buy this book because you don’t need it. Mwah, beetje oppervlakkig, beetje teveel lijstjes en te weinig praktische dingen (ik ben nochtans een lijstjesfan, maar zo'n BuJo draait voor mij toch in de eerste plaats om het praktische). En heb ik er nu overgekeken of werd de uitvinder van het systeem, Ryder Caroll, niet eens vermeld? Credit where credit's due, jongens! It is thicker than my journal but in a similar size so I can keep it nearby as I work. It is full of easy doodles that I want to try, and also has several quotes I want to copy. nice reminder on what can be tracked with a bullet journal and lots of examples, tips and new ideas. Good reference book for when I have time to concentrate on my bullet journal project. I've read multiple books about bullet journaling, but this is probably my favorite so far! So many great ideas! Pulled out a few ideas. Having spent about a year bullet journaling, I’ve found much of the culture around it either utilitarian or both overwhelming and shallow. This book was a quick and breezy approach to broadening the methodology, inviting new ideas, and thinking of the different possibilities. In this way, this book offers what most websites and Pinterest pages can’t. Avid bullet journal users may decide the pickings here are slim, but those open to exploring the BuJo or looking for ideas beyond rapid logging wil Having spent about a year bullet journaling, I’ve found much of the culture around it either utilitarian or both overwhelming and shallow. This book was a quick and breezy approach to broadening the methodology, inviting new ideas, and thinking of the different possibilities. In this way, this book offers what most websites and Pinterest pages can’t. Avid bullet journal users may decide the pickings here are slim, but those open to exploring the BuJo or looking for ideas beyond rapid logging will likely find Compton’s writing style engaging and the content thoughtful. I liked this book a lot, it is packed with lots of ideas. Although I’m going to read more guides because no one can’t include all the ideas. To collect the best ones for yourself means reading several bullet journal guides. That’s fun and entertaining, too. Ihan hyvä ideoita täynnä oleva kirja, saapui tänään Amazonista, josta tilasin sen käytettynä. Yksi vika siinä oli mikä ei kylläkään ollut kirjailijan - valtava pesuaineen tuoksu josta tuli huono olo. Kestää kyllä hetken että voin palata kirja I liked this book a lot, it is packed with lots of ideas. Although I’m going to read more guides because no one can’t include all the ideas. To collect the best ones for yourself means reading several bullet journal guides. That’s fun and entertaining, too. Very informative with lots of ideas. I liked this better than "How To Bullet Journal", although I did get ideas from both. This one has a lot of diagrams of things to try out for boxes and shapes etc. Not the sort of thing I'd normally read but received this for a present. Had some interesting ideas, not all I found useful but it will be different for everyone. And I started my very first bullet journal today so it must have learnt something. Idealna książka dla osób zaczynających swoją przygodę z bullet bookiem/journalem. W środku znajduje się wiele praktycznych pomysłów na wykorzystanie dziennika, a także proste, łatwe do powielenia przykłady grafik, czcionek i ozdobników. This book teaches us how to use a bullet guide as a diary, journal, to-do list, and charting system for various purposes. Having never seen a bullet guide before, this book gave me lots of ideas on ways to make use of it. I find it very helpful! Not good for library if you want to write in it. Some good ideas for lists, organizing and journaling. Can't imagine that much time to do half of the suggestions. Honestly, this is what I wish Ryder Carroll's book had been more like. This is full of creative and fun ideas for bullet journal enthusiasts. A lot of this seems more work then it is worth. However I am always searching for ways to help my students keep themselves on track. I loved this pretty little book. Many pages and ideas are bookmarked for my own work! I bought this for some new ideas for bullet journal spreads but much of the rest of it isn't anything new. Useful ideas for beginners. And artwork. Basics for beginners and those with lots of time to doodle in journals. Not too realistic for most but would please many.